Could not resist reposting this short video about Costco Japan. Topic: Why Is Anime Obsessed With Power Lines? Wait, is Gaoranger already released? Took off the 4 useless options and added instagram and discord (however unfortunately discord still does not allow direct linking to your profile so you'll just have to c/p if you want to talk to anyone else). Just a note of thanks to the translation and subtitling team at TVNihon for working on this series. It helps that the Toei company produced such an arresting series. Topic: Problems connecting to the tracker? Centurylink has been having a major outage in the past two weeks which has affected both 911 services (voice) as well as Internet connectivity for some people. Topic: Lupin VS Pat 45 Released! Re: Lupin VS Pat 45 Released! 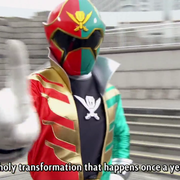 So far, we have Ninpuu Sentai Hurricaneger on March 26th. This leaves Bakuryuu Sentai Abaranger as the final remaining Super Sentai series (Jetman and later) which is untranslated by TV Nihon. Topic: Lupin VS Pat 44 Released! Re: Lupin VS Pat 44 Released! Don't know if it matters, or if there should be a second version, but there was a type at 13:46 "itheir" instead of their. I can confirm this on the HD version. A holy transformation that happens once a year! I know I'm breaking several forum rules here. But, I have to ask. Is this translation project on hold at the moment due to something called "real life"? I guess that's one way to have a Kamen Rider-Garo crossover.